Russia is a vast multi-ethnic country with a rich farming tradition, and has a tremendous amount to offer in the culinary arts. Many Russian dishes are derived from traditional peasant food eaten in the country's huge rural expanses. Crops of rye, wheat, millet and barley provide the ingredients for breads, cereals, pancakes, kvass (a bread drink), and of course beer and vodka. Other common ingredients include a variety of vegetables as well as fish, poultry and game, as well as mushrooms, berries, and honey. Additionally, the influence of Russia's historic neighbours such as Persia and the Ottoman Empire can still be seen in some Russian dishes. From the time of Catherine the Great (who reigned from 1762 to 1796), Russian nobility imported products and household staff from Austria, Germany and most especially France. The result was a plethora of new dishes, infact a whole new Franco-Russian cuisine, that includes some of the most famous "Russian" dishes: beef stroganoff, sharlotka (Charlotte Russe) and veal Prince Orloff. Beef Stroganoff - This dish probably has Franco-Russian roots, although the exact details of its exact origins have been lost - it may perhaps have been named after the Stroganov family. The dish consists of sautéed pieces of beef served in a sauce with sour cream. Blini - Thin pancakes made from wheat or buckwheat, and usually topped with either sour cream or caviar. Borshch - The Russian variant of borscht. A vegetable soup made with beets, but meat, cabbage and potatoes may be added. Charlotte Russe - A cold dessert created by French chef Marie Antoine Carême who was employed by Czar Alexander I. It is a mould, lined with lady fingers (small sweet light sponge cakes) and filled with Bavarian creme (a custard made with flour, thickened with gelatin and flavored with liquer). Katlyeti - Small pan-fried meatloaves made from pork or beef. Okroshka - A traditional cold soup made from kvass (bread drink). Okroshka can be prepared in meat, fish or vegetable varieties. A combination of neutral tasting vegetables (such as potatoes, turnips, rutabagas (yellow turnips), carrots or cucumbers) and spicy vegetables (mainly green onion, plus celery,chervil, dill, parsley or tarragon) are used in making the soup. 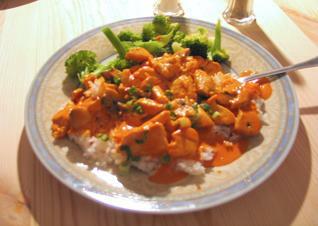 Spices such as black pepper, mustard or pickled cucumber may also be added. Pelmeni - A thin dough (made with flour add eggs) filled with minced meat (beef, lamb, pork, or a mixture of all three, may be used). Spices such as garlic, onions and pepper are mixed into the filling. Pelmeni are cooked by boiling (although sometimes they are fried after boiling), and then served with butter or sour cream. Pirozhki - A stuffed bun or pie that is filled with a cooked filling. Traditional fillings include fish sautéed with onions and mixed with chopped hard-boiled eggs, chopped boiled meat with onions and eggs, or mashed potatoes with eggs and sour cream. 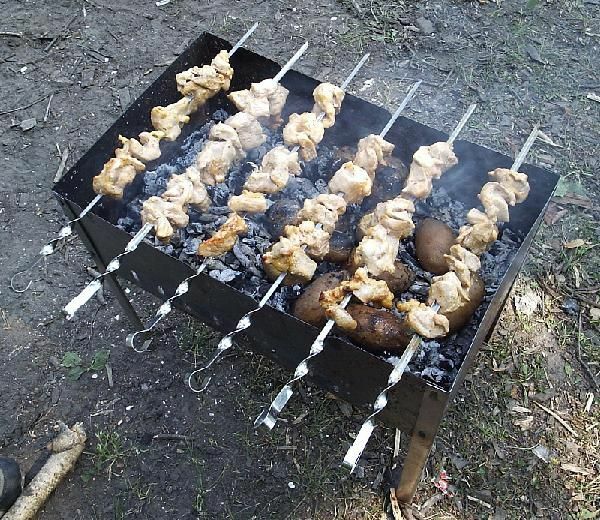 Shashlyk - The Russian form of shish kebab. Shashlyk features alternating slices of meat and onions. Shchi - A traditional cabbage soup. There are many varieties, for example the poor typically made the soup just from cabbage or onions, but richer variants might add meat, carrots, parsley, spice herbs and sour ingredients (the latter might include smetana (sour cream), apples or pickle water). 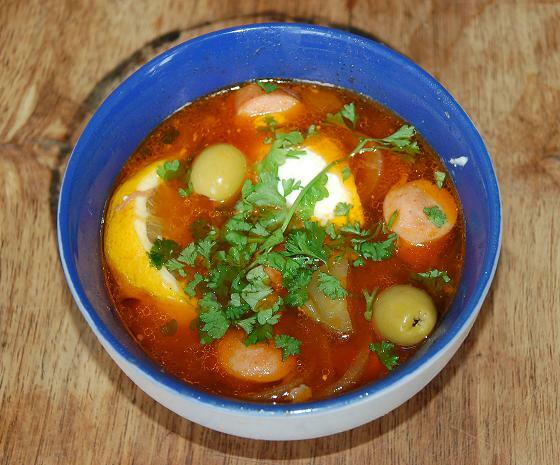 Soljanka - A thick spicy and sour soup. There are three main varieties: meat, fish or mushroom. All variants also contain pickled cucumbers, and usually cabbage, cream, dill and salty mushrooms. Studen (Kholodets) - Jellied pork or veal, with spices and a small amount of vegetables. The food is prepared by boiling the meat for an extended period of time, and then chilling the dish. The dish may be eaten cold, in which case it is served with grinded garlic with smetana (sour cream), horse radish or mustard, or may be used as a garnish for other dishes. Teur - A variation of okroshka, but using bread instead of vegetables. Veal Prince Orloff - A Franco-Russian dish created by Urbain Dubois, to Prince Orloff, the Russian ambassador to France. Veal Orloff is a braised loin of veal, cut thinly into slices, with layers of pureed mushrooms and onions between each slice, then topped with bechamel sauce (white sauce) and cheese, and browned in the oven.